TGIF! My morning is off to a good start because I’m eating one of these Oatmeal Fudge Bars. I almost didn’t make them because 1) they require instant coffee and I’m not a coffee drinker so I didn’t want to buy any, and 2) the original recipe called for quick oats and I only keep old fashioned oats on hand. Luckily, I found these Nescafe Taster’s Choice single serve instant coffee packets at Target that were only like $1.25. And, after a quick Google search, I learned that using old fashioned oats instead of quick oats works fine. So I was good to go. 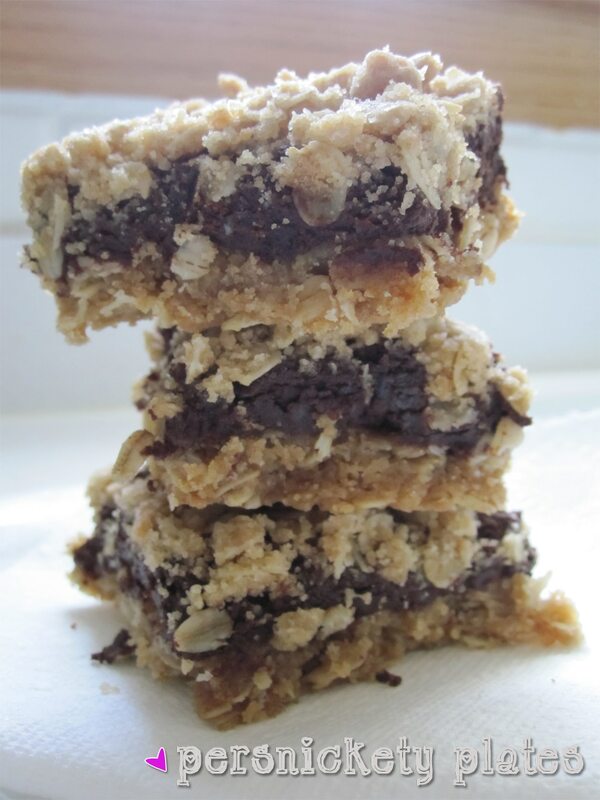 These are good – very fudgey and crumbly, but they have oatmeal so they’re healthy, right? Right. Though the prep time is a little long because you have to do it in stages, this recipe is simple and doesn’t even require a mixer. Before I cut it up. Preheat oven to 325 degrees F. Line an 8-inch square baking pan with aluminum foil, allowing excess to hang over pan edges. Grease foil; set pan aside. Combine the oats, 1 cup of the brown sugar, ¾ cup of the flour, baking powder, baking soda, and the pinch of salt. Stir together in a bowl to combine. Melt 8 tablespoons of the butter and stir into the oat mixture until combined. Reserve ¾ cup of the mixture for the topping. Sprinkle the remaining oat mixture over the bottom of the prepared pan and press into an even layer. Bake until light golden brown, about 12 minutes. Cool completely, about 1 hour. Combine the remaining ¼ cup of flour, the remaining ¼ cup brown sugar, the instant espresso powder, and remaining ¼ teaspoon salt in a small bowl; set aside. Melt the chocolate chips and the remaining 2 tablespoons butter in a large bowl, microwaving at 50% power in 30-second intervals, stirring after each. Let cool slightly. Add the egg and whisk until combined. Use a rubber spatula to fold in the flour mixture, stirring until just combined. 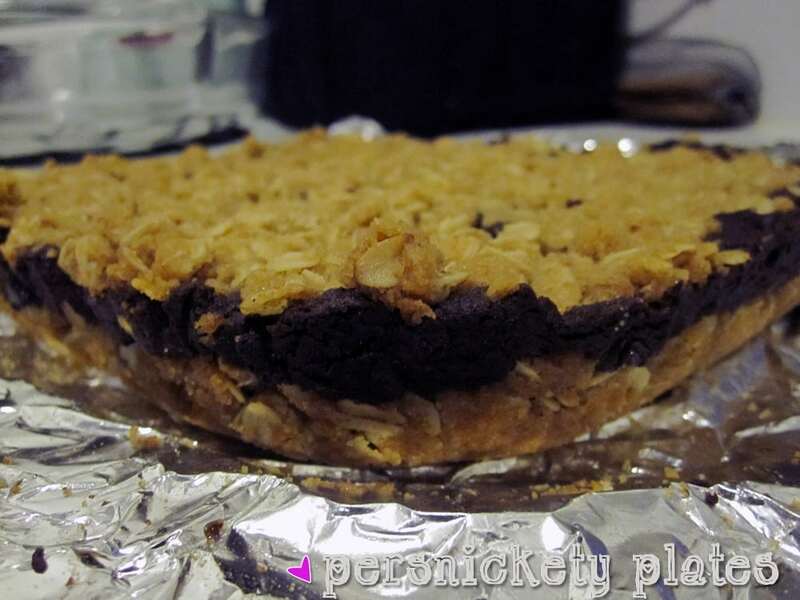 Pour the chocolate filling over the cooled crust and sprinkle with the remaining oatmeal mixture. Bake until a toothpick inserted in to the center comes out with a few moist crumbs attached, 25 to 30 minutes. Cool completely on a wire rack. Using the foil overhang, lift the bars from the pan and cut into squares. Store leftovers in an airtight container at room temperature.